Coinciding with the Library’s Words of war: conflict in Welsh literature exhibition, Dr David Moore will be talking about one of the most interesting periods in both the literature and the military history of Wales, namely the eleventh and early twelfth centuries. This was a time of renaissance in the literature of Wales – the Mabinogi, Geoffrey of Monmouth, the Gogynfeirdd, and much more. It was also a time of bitter warfare involving not only the Welsh themselves but also Normans, Vikings, Anglo-Saxons and others, all of whom had their own perspectives on events. 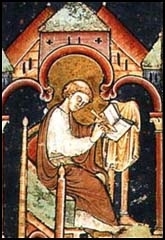 Gerald of Wales is currently considered a "single author." If one or more works are by a distinct, homonymous authors, go ahead and split the author. Gerald of Wales is composed of 14 names. You can examine and separate out names.